When it comes to the world of gambling over the Internet, innovation is the catalyst and lifeblood for the growth of today’s business. Cyber gambling operators that aren’t able to adapt to and grow with changes and leverage innovations to their advantage simply don’t survive. Red Star Casino breaks the status quo by creating uncontested markets, making the competition irrelevant and pursues differentiation in conjunction with superb customer service. Strictly speaking the operator ushers in a new era of gaming, a proverbial crystal ball of tomorrow’s innovations. To gauge the quality of an operator, one must look at the design of its website, the quality of the software providers that powers its suite of casino games, licensing and promotions. I’m happy to report that Red Star Casino ticks all the boxes. The operator employs a slew of instant-play vendors such as Microgaming, Net Entertainment, Play’N Go, Betsoft, NYX Interactive and GamesOS/CTXM. As such its game diversity is unrivaled. 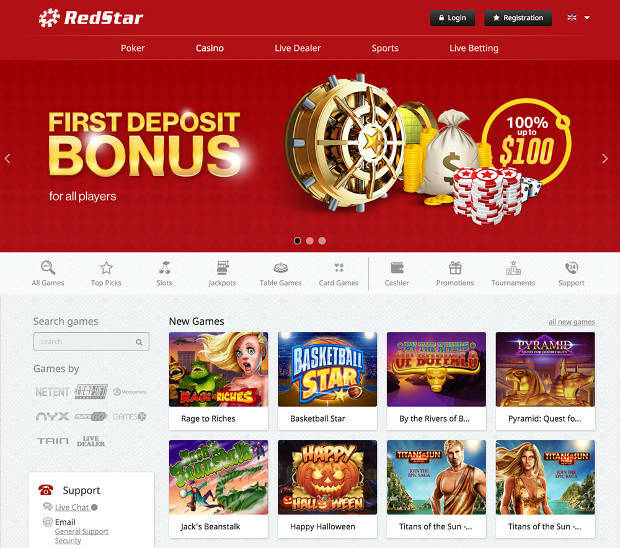 If you want to safe yourself some extra cash and to prolong your playing time at the casino; Red Star offers you a match bonus of 100% up to $100. Before the bonus is credited to your account you must deposit $10 and provide the bonus code 100RSC. Let’s assume you accept the bonus and deposit $50, your initial deposit will be doubled instantly (100% match bonus). Before a cash out is permitted the bonus must be rolled over 40 times. In other words, 40x$50=$2,000. All slots machines count 100% towards the completion of the play-through. You are not allowed to wager more than $5 per spin. If you do this the bonus will be cancelled. Only one bonus per player is allowed. Once you’ve accepted the bonus you have 15 days to complete the WR. Players from the following countries do not qualify for the bonus: Bulgaria, Hungary, Poland and Romania. If you need more information before you sign up, the operator can be contacted from Monday to Sunday, 24/7, through telephone, live chat or email. Live chat is the quickest and most convenient method. The live chat support staff need to up their game since there’s been a few complaints of poor service. The Frequently Asked Section is not as detailed as one would expect from an online casino of this caliber. However, it provides some valuable information on how to create an account, how to deposit and withdraw money, and what to do when you experience a software glitch. In line with the casino’s responsible gambling policy, all players must be 18 years and older. If you’re not sure if you’re a problem gambler; an assessment test (multiple questions) helps you determine whether you have a gambling problem or not. It’s in your best interest to answer the questions honestly. To ensure that your account is not compromised, Red Star Casino states that it uses encrypted software. Once you’ve registered an account store your login details to the casino in a safe place. Although the operator states that its software (RNG) is audited on an on-going basis it does not corroborate this figure (96.6% RTP) with a valid audit report by a reputable firm on its website. The Microgaming games are tested regularly by eCOGRA for safety and fairness. Is The Bonus Wagering Steep? No it’s not. It’s in line with that of the industry standard. Unfortunately, the bonus can only be used to play slots machines. Are progressive Jackpots included in the withdrawal limit? No, they are not. All progressive wins will be paid out in one single payment. Is the withdrawal limit okay? Yes, it is. The current weekly withdrawal limit is $9,000. In summary. Any seasoned player will tell you that Red Star Casino is the complete package. With an extensive game variety by different software vendors, wholesome promotions and a VIP program I tend to agree. As a relatively new comer to the world of cyber gambling I could not find any payment complaints against it at this stage. Suffice it to say it’s sailing like a majestic schooner on the high seas. Recommended. Red Star Casino offers a healthy collection of promotions. First time players are welcomed with a deposit bonus of 100% up to $100, 10% cashback on losses, freerolls poker tournaments, live sports betting, free spins that could be won and cash prizes up for grabs. The only downside is that the VIP program is by invitation only. Regrettably Red Star Casino does not offer a myriad of banking methods like most other operators. Since it focuses more on the Eastern European market, you can register an account with one of the following: Bitcoin, MasterCard, Neteller, Sofortuberwaisung, Moneta, LiqPay, Skrill, QIWI, Visa, UnionPay, WebMoney, Wire Transfer. Withdrawal requests via e-wallets will be cleared within 12 hours, maybe sooner. Bank transfers can take up to 7 working days and credit and debit cards up to 5 days. Just make sure that when you do request a withdrawal that you provide the proper documents (copy of your passport, ID or driver’s license and utility bill). The maximum weekly withdrawal limit is $9,000. Deposits can be made in any currency but will be converted to U.S dollars at the current exchange rate. Long story short, the browser-based game variety is well covered. It caters to players who have a penchant for poker, sports betting, slots machines, virtual blackjack, roulette, pai gow poker, baccarat, casino war, a live casino and 7-figure jackpots. The graphics and animations that play off in the slots are colourful, crisp and vibrant. Although most players normally go for the NetEnt slots, I suggest you give the Leander games a shot too. They also offer a slew of multipliers, bonus rounds, wilds and scatters. I might add, the graphics that feature in them are not on the same level as that of the Betsoft, NetEnt and Microgaming games. When it comes to video poker I’m normally all in. This is the only game within the virtual casino that does not favour the house predominantly. Try your luck at popular titles like Jacks or Better, Joker Poker and Double Bonus Poker. Remember, always bet the max. bet. We live in a digital age, information is just a click of a mouse or a single press on a mobile phone away. Red Star Casino is compatible and loads easy on all mobile devices. The operator can be accessed from a tablet, Android or iPhone. Seven live games can be played of which 3 are against the live dealers. The live dealer games on offer are blackjack, baccarat and roulette. These games cannot be played for free only for real cash. They are streamed to your computer via webcam from a live studio. The fact that a random number generator does not have an impact on these games is advantageous to the player. I must point out that baccarat and blackjack are skilled games, whilst roulette is more reliant on luck. The other games blackjack multiplayer common draw, blackjack standard, auto roulette and roulette. These games can be played for free or for real money.